This is one of the most innovative, albeit silly applications of social media I have seen yet. A company called Botanicalls has come up with a combination of do-it-yourself electronics and computer code that allows your house plants to Twitter you when they need water! Everything you need is listed on their web site. All you need is a DYI moisture sensor, an Arduino electronic board and either an old Blackberry or laptop with internet access. 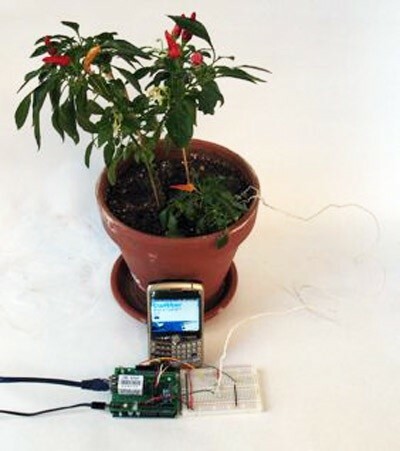 They provide the computer code download which allows your plant to communicate directly with you through Twitter, the extremely popular microblogging service. The moisture level of the plant’s soil drops below the satisfactory threshold, it will send a status update that your plant needs to be watered. There is a rapid rise in soil moisture detected as a watering event. The plant will then determine if the soil moisture has risen to the desired level for a proper watering. If it has, then it will twitter its thanks.